Wedding photography is more than just taking pictures. It is not about just having the newest DSLR and photo ops. It is more than just having a photograph. Wedding photography involves technique, creativity, artistry, and emotions. Thus, soon-to-wed couples should make sure that they employ the services of a wedding photographer that delivers more than just photographs. He should be able to provide captured memories of the couple’s big day that are worth preserving. Moreover, the couple should also consider other factors such as the credibility and character of the wedding photographer, their rates and wedding packages. Some couples believe most of the good wedding photographers are based in Metro Manila – either because they are more compettive, have access to trainings and latest technologies. Fact is, the most creative and artistic Pinoys are scattered all throughout the archipelago. Visayas, for instance, prides itself of its great wedding photographers. The island group houses professional wedding photographers that have already established their names in the said industry. Years of experience and education made these Visayan professional photographers popular not just in the South, but in the entire country. Paloma Photography, Inc., formerly known as VB Studio, has been part of Iloilo’s wedding industry since 1950s. It is a family business of the Palomas and is currently owned and managed by Mr. Vero J. Paloma, Jr. Paloma Photography pioneered digital wedding photography in Iloilo and it popularized the “magazine layout” of wedding albums. It is dedicated to provide couples high quality wedding photos while promoting the appreciation of portraiture as an art. Mr. Paloma’s experience and international education, together with his commitment to nurture customer relationships and provide quality service, have made Paloma Photography one of the most sought-after Iloilo wedding photographers. 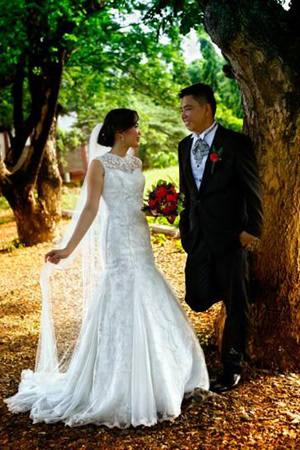 Ysabelle’s Bridal Shop Digital Photo-Video, another pride of the Bacolod wedding industry, on the other hand, boasts of its commitment to provide quality wedding photographs and videos at a competitive rate that would meet their clients’ budget and expectations. To see more Visayas-based wedding photographers, videographers, and other wedding suppliers, just use the Search for Wedding Suppliers tool in www.kasal.com and choose any of Visayas’ wedding destinations.